3 weeks before the little one arrived, a friend of mine gave me a pile of baby books she had lying around. I suddenly realised that this baby was nearly here and I hadn’t looked at a single book for advice! I read up on everything – so why not this?! I read a few of the books during the start of my maternity leave before the little man arrived and tried to process all of the information. Jeez, I thought, this really was going to be a military operation this parenting malarkey! But, it was all there in back and white, so I should know what to expect when he/she arrives. It’s like a manual! 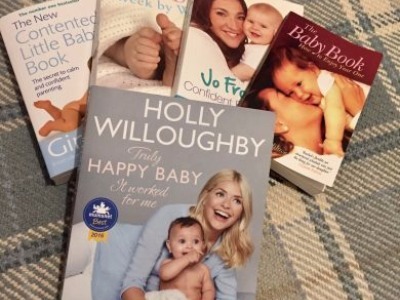 I then bought Holly Willoughby’s Truly Happy Baby as I was a fan of hers and it had just been released. The book made me feel at ease a little as it was full of tips and tricks rather than a rigid structured guide. It was nice to get a variation, and see what a real mum recommends. Once the little man arrived I kept referring back to the books week on week to see what should be happening that week. But, more often than not, I found that it wasn’t going quite to plan! He wasn’t sleeping as long as he should, he wasn’t self settling – what was I doing wrong? At 12 weeks I decided enough was enough and that some of the the books needed to go into the bin – especially when they told me that my 4 month baby should be sleeping through the night! From now on, I’m only going to buy the down to earth parenting books. I wish I hadn’t wasted my time worrying about milestones. My baby will do what we needs to do when he is ready. This means a much happier (and less worried) mummy.